I couldn’t have wished a more perfect New Year’s Eve than the one I had in Abel Tasman National Park. No matter it’s the smallest National Park in New Zealand, Abel Tasman is mesmerizing. Green hills, lovely forests, golden beaches, blue and turquoise water and, most of all, an almost untamed scenery. Since I wanted to see Abel Tasman from different perspectives, I started with a catamaran cruise in the morning. The day was sunny albeit chilly while we sailed from Kaiteriri to the bay of Anchorage. I was enchanted by the superb views on the coasts, the fjords at high tide, the surrounding hills and greenery. Close to Adele island, we spotted a solitary blue penguin peacefully swimming and a few fur seals resting on the rocks. A picnic at Anchorage bay, a little sunbathing and I was ready for the hike back to Marahau. The 12,5 km coastal walk is easy and just lovely (more on this hike soon). Bordering the Tasman Sea but a little above the sea, the path is mostly in the forest, with shade protecting from the strong sun. From time to time, a viewpoint overlooking one of the golden beaches offered amazing views. I ended up at my hostel a little tired but incredibly happy. 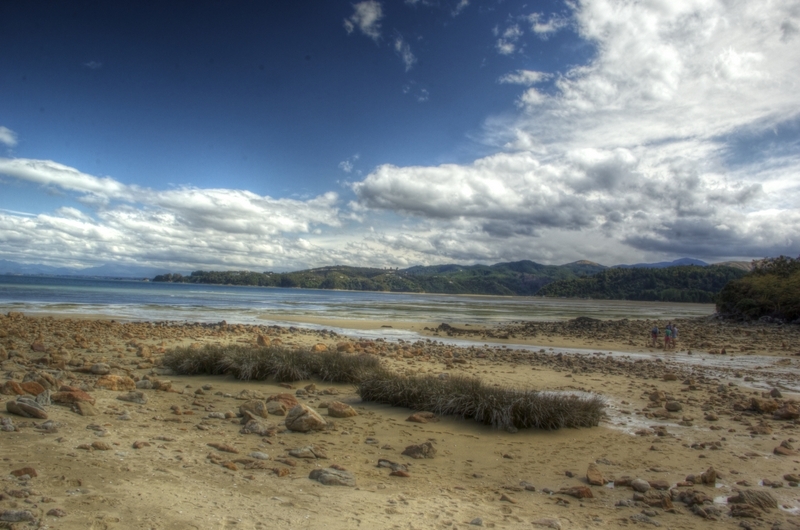 New Year’s Eve at Abel Tasman National Park was more than I could ever have hoped for, a glorious, unforgettable day. Note: Warm thanks to Tourism New Zealand, which kindly provided me with an Explore NZ Card entitling me to a number of free or discounted activities. More thanks to Stray Bus for the awesome comprehensive Stray Everywhere pass to travel across North and South Island on their hop-on-hop-off buses, as well as for stopping in Marahau, at the beginning of the Abel Tasman National Park and the hiking trail. Although blessed with these great opportunities, the enjoyment and fascination in front of Abel Tasman sheer beauty was all mine. Wow, great photos and post. Seems like you have a very good beginning of the year. Thanks Michael. It was indeed a fantastic beginning for what I hope will be a great year! Sounds like a perfect way to ring in the New Year.